For 700 years, Christian pilgrims have sought out the Razzouk family for their tattoos. Generations of the Razzouk family have tattooed people to commemorate their spiritual journey to Jerusalem. And yes, they’re still very much open for business today, in a dusty back ally in the Old City. The family’s incredible history adorns the walls of the small studio as modern day pilgrims wait for their certificate in ink — typically a cross with a date. Wassim Razzouk, 43, now runs the business (as seen in the video link below.) He’s busy placing the outline of a design on a former US soldier — an example of his diverse clientele. The tattoo will be an Armenian cross, which holds special meaning for Andrew Seropian, a veteran of the US campaign in Afghanistan embarking on his own pilgrimage. Pilgrims make the journey to the Holy Land searching for something. It could be an adventure, inner peace, or God. Christians, Muslims and Jews claim Jerusalem as a holy city. It houses the holiest of sites of Christianity and Judaism and the third holiest in Islam. The Razzouk family business began in the 14th century in Egypt then moved to Jerusalem in the 17th century after discovering there was a high demand for their services in the holy city. Pictures of four generations of the Razzouk family hang on the stone wall of the studio. “We are not only old school … you can say we are ancient school. We have designs hundreds of years old,” says Wassim, holding a long wooden stick with a pointed end. “The way they did it hundreds of years ago was done by a stick like this one with thick needles attached to it. This created a thicker, blurrier line that wasn’t too sharp,” he says. It was both painful and painfully slow, adds Anton. Thankfully, the inking process has modernized. 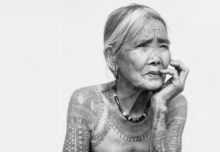 But many of the tattoo styles remain the same. Wassim pours small wooden blocks on a table. Carved on each one is a stencil of a tattoo. He pulls out one with a large cross and four small crosses in the corners — it’s known as the Jerusalem Cross and dates back centuries. It’s also one of the most popular designs. “This one is 500 years old. This actual block was used in 1669 by a man who documented his pilgrimage,” he explains. There is a distinctive divide in the tastes of Razzouk’s clientele. Pilgrims prefer the traditional Christian iconography, while young local Christians prefer modern-looking tattoos with intricate designs and coloring. However, they do have clients from other faiths who choose non-Christian designs. “You cannot deny your Christianity by having a tattoo,” says Anton. “That’s why in Egypt and in many other Arab countries where Christians are a minority, parents tattoo their children so they can’t deny their faith.” This is still very common in Egypt. The ink almost dried up when Wassim initially had no interest in the family business. “I read an article about my family and my father said he was afraid that tradition would end with him,” he recalls. Wassim eventually relented and decided to pick up the tattoo machine after all. “This is not a tradition and a heritage that is easy to let go of and I am not going to be the one who is going to stop it or kill it,” he says. The mark of faith is also secured for the next generation. Wassim’s 13-year-old son, Nizar, is learning the family business to certify future pilgrimages in ink. Story derived from CNN video, watch it here.